Children are naturally honest people when they first enter this world. As parents, we have to figure out how to keep our child from doing things like walking up to that guy in the restaurant and asking him why his tummy is so fat (real experience here). It is a difficult thing to teach a child about tact while still requiring honesty in life. Some children are naturally more black and white than others. Some have a natural ability to hone in on the feelings of others. Some are far more naturally socially aware than others. Some are able to think things without needing to express them at high volume. In other words, some seem to have better social skills than their parents while others need a fair amount of coaching. So how do you teach a child to speak honestly but also with kindness? How do you teach the concept of tact? How do you get a child to read a social situation and understand that not all things NEED to be said? An important step is to teach your child to love others and how to show love. Another is to teach your child to think about how they would feel if the situation were reversed. That can work for a lot of kids. But there is still a category of people out there who are basically like defenders of truth, and truth is truth no matter the consequences. I fall into this category, and my son Brayden (age 8) does, also. If he is aware of something being spouted off as truth when he knows it is not true, it is basically impossible for him to stop himself from saying so. He is a frank person and always has been. And I so get it. It is still hard for me to hear someone say something that isn’t true and not correct them. I have to have internal dialogue to stop myself from saying things that don’t need to be said. And those moments I have to talk myself down are basically seared in my brain for years. It is very difficult for me to let untrue things be documented–no matter how trivial. I have tried explaining to Brayden about understanding when to say something and when not to. But here is the thing. This is a gender stereotype, but we all are aware that men and women are different. We see things differently, and men have a very different perception of feelings than women do. 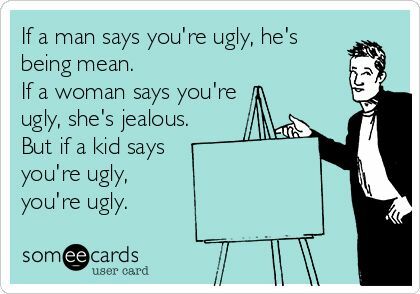 There are some tactless women and some sensitive men, but by and large, females are naturally better at figuring out what does and does not hurt feelings than males are. I naturally have always had more understanding of how others are feeling than Brayden does. So my efforts in helping Brayden learn to read when to say something and when not weren’t really a fast solution. I totally believe he can improve his ability to read people and with life experience realize what you should and should not say to people, but until then, he needs a mechanism that helps him NOW. Then I found this fabulous acronym. 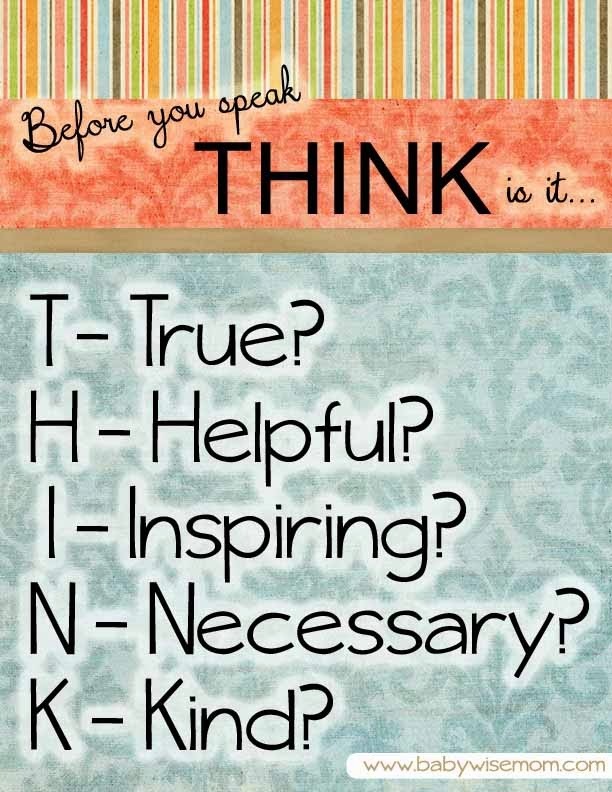 THINK. This has been so, so helpful. Almost everything Brayden wants to say to people is true. That isn’t an issue. Some might find this acronym helpful if they have a child who likes to toy with the honesty line. The helpful question is one that can be debated. To someone who is a black and white person, the truth is always helpful. Inspiring is a great question. Does it help the person to be better in some way? This can be debated also with the black and white person, but it will cut back some comments. Another great one is the kind. How will it make the person feel. Usually you won’t make it to kind if the comment wasn’t necessary. Brayden is a kind person and he does not want to hurt feelings. Just focusing on the kindness wasn’t enough, but having those other four steps before the kind makes him analyze it more accurately. I love this acronym for several reasons. One is a comment has a rigorous five-step qualification process it must pass before it gets said. Another is when he forgets to check his comments, I can simply say, “Think” to him and he immediately knows what I mean. I don’t have to give him a lecture, embarrass him in front of people, or pull him aside for a talk. I can say, “think” and he knows what I mean and he can change. Finally, I love it because sometimes hard things do need to be said. Sometimes we really need to say things even if it isn’t what another person wants to hear. We can form what we need to say into being phrased in a kind way. We can stand firmly on our moral ground and position. And maybe some people would find this acronym helpful for a people-pleasing child who is prone to say whatever the person wants to hear rather than what the person needs to hear. This has been a very handy tool for us. Give it a try! Yep you can certainly use it! It is always good to credit where you get things from, though.